I've been a bit critical about a few books I've read lately and I've decided that it's time to end the negativity. After a bit of navel-gazing, brought on by said negativity, I decided that I was feeling a little jaded about the books that are out there at the moment. I mean, I've read some doosies lately - shockers and I was a bit over it. Where to find a good book? How to find that masterpiece of prose and imagery, woven together to produce a tale that stays with you long after you've closed the book? I was in despair! You see, I purchase a lot of books on my Kindle, and because time is short and the Kindle book store is massive, I often look at recommendations. What Amazon do, is they look at your purchase history and recommend books based on that. I have purchased a few duds lately so guess what Amazon is recommending? Yep, you guessed it! More duds. So, in desperation, I went to Goodreads - okay, no brainer really! 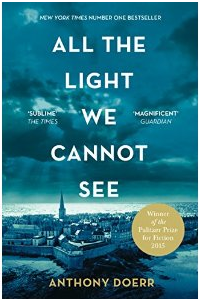 On the front page is a list of genres - that's where I started and that's where I found All the light we cannot see by Anthony Doerr. Back to my Kindle, I went, searched for it, bought it. At something like $14, it was dearer than most books I purchase for my Kindle (probably part of my problem), but the reviews in Goodreads were good and so were the reviews on Amazon. I took a chance on an author I'd never heard of, on a genre I usually don't read. OMG - that's Oh. My. Godfather!!! I could not put this book down. It was written in small, bite-size chapters that said so much in so few words, as to be truly a work of art in itself. Gruesome details of WWII were portrayed in such as way as to give you a glimpse of the brutality and then quickly retreated before you became too absorbed in the horror and lost sight of the story. I'm not going to give you a run down of the synopsis here, but would urge you to go to Goodreads and read it for yourself. So there we are, my faith restored - there really are some great writers out there and Anthony Doerr is one serious scribe! I hope you read it. If you do, I'd love to hear what you think. To me, it's one of the best books I've ever read - and that's saying a lot because I probably read about five or six books a month. Oh, and it was only after I'd finished reading All the light we cannot see, that I discovered Doerr won a Pulitzer for it. Well deserved! I would even say that in years to come, this book will become a classic of historical literature. Until next week, find joy between the pages of a future classic!